When “Coach Matt” and I got engaged, as any couple would, we wanted to make sure our wedding reflected our personalities and interests. We worked out so many details to make the day extra special; from being led down the aisle by ballerinas en pointe, to incorporating handstands and a back tuck into our first dance, to the little things like using golf ball place cards on tees and surprising Matt with a Blackhawks playoff towel hanging from his seat at the reception. 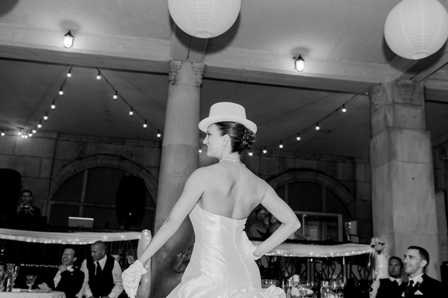 I had an obvious ballet influence in various aspects of the wedding day. 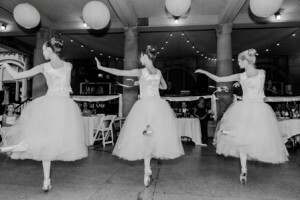 My bridesmaids’ dresses were ballet pink in color, I had three long-time ballet students as junior bridesmaids, and even our flower girls wore ballet shoes with their dresses. As the guests arrived, the classical music playing in the church was Prokofiev’s Romeo and Juliet. 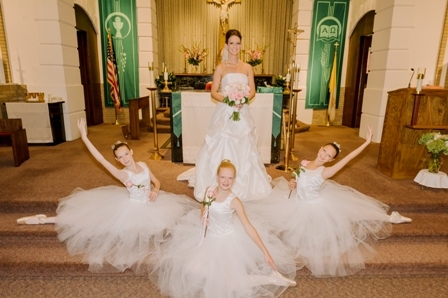 As the ceremony began, Abby, Allie and Kaylor- the “ballerina bridesmaids”, as I called them, waltzed down the aisle to the Waltz of the Flowers from the Nutcracker, followed by the bridesmaids, flower girls, and ring bearer. Then it was my turn. My father is a talented actor and singer, and I grew up watching him perform in dramas and musicals. He has always been very supportive of my passion for dance and encouraged me to follow my dreams pursue a career in it. I had a difficult time deciding on music to walk down the aisle to, and struggled for months with the decision. Finally it hit me close to home-literally. I have a music box on my dresser that my dad bought for me when I was young. He traveled to Germany for work and brought it back for me. It’s a beautiful music box that plays the song “Edelweiss” from the Sound of Music. Perfect! It was settled, that would be the song playing when my father walks me down the aisle. On to the reception. Now I couldn’t just do traditional, normal dances, could I? 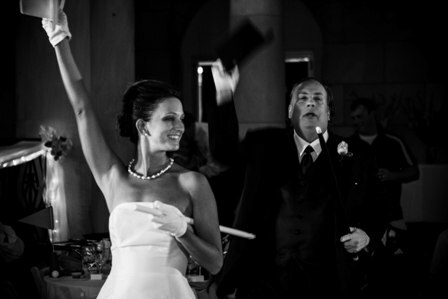 First, my father continued a tradition he began when his first child got married-he dedicated a song to Matt and I. He chose a very special and fitting song to sing to us: Leann Womack’s “I Hope You Dance”. Just as dinner wrapped up, the ballerina bridesmaids performed a beautiful pointe dance choreographed by their DanceQuest instructor Olivia Woodall. I had asked to work with them on something special, but until that moment I had not seen the dance, or even heard the music. It was so beautiful! Next came my dad and I. We began with a very touching song, but promptly asked the DJ to stop the music-it just wasn’t us. We got out our top hats, gloves, and canes and performed Broadway style to “Everything Old is New Again”, kickline and all! I had so much fun collaborating on the choreography with my dad. We had many rehearsals leading up the wedding day. Each time that rehearsal wrapped up, Matt would come in and we would work on our dance! Heather Lucas (DanceQuest instructor) put together a great dance for Matt and I. We chose “Sweet Pea” by Amos Lee for our song. It’s such a sweet, cute song, and fit our personalities so well. 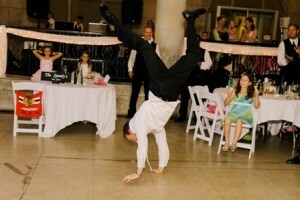 This was Matt’s time to shine as a gymnast! He will tell you dancing is not his thing, but he can really hold his own. At one break in the dance, he shows off his back flip, then proceeds to walk on his hands back over to me to continue-all in a tuxedo! The dance floor opened up to the crowd and everyone had a great time. The last bit I put together was something that Matt had suggested a few months before the wedding. In a conversation he said “What if we did the Harlem Shake at the wedding?? And all the guests got involved? Wouldn’t that be awesome?” I agreed, but we didn’t pursue it with all the other hundreds of things we were working on to prep for the big day. Little did he know I did not forget, and I put together a huge prop box with all kinds of funny costume pieces, masks, hats, and accessories. The wedding party spread the word to all the guests during the reception, and at precisely 9pm, we sat Matt down in the middle of the dance floor. Groomsman Chris (friend of Matt) started off the dance wearing a funny green tie, and when the music kicked in, chaos ensued! Wedding guests in costumes all over the dance floor, and Matt in total shock. He was so surprised we pulled it off without his knowledge. 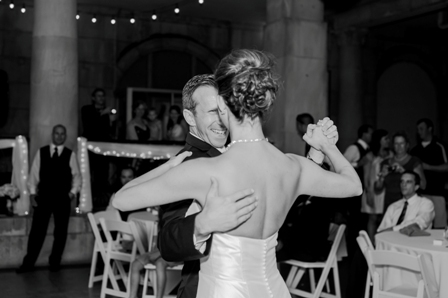 After initially putting pressure on myself to make our wedding day so perfect, I realized no matter what we decided to include in our day it would be perfect because it was about us. But we definitely had a lot of fun along the way and couldn’t be happier with the outcome!